Where to Swim in Santorini? Santorini Holiday Cars shares his personal choices for best swimming beaches on Santorini, along with reasons why we chose the beaches, advices for enjoying your beach time, and photos. One of the most beautiful beaches on the island is the Red beach, certainly the most spectacular beaches and one of the most picturesque Aegean. 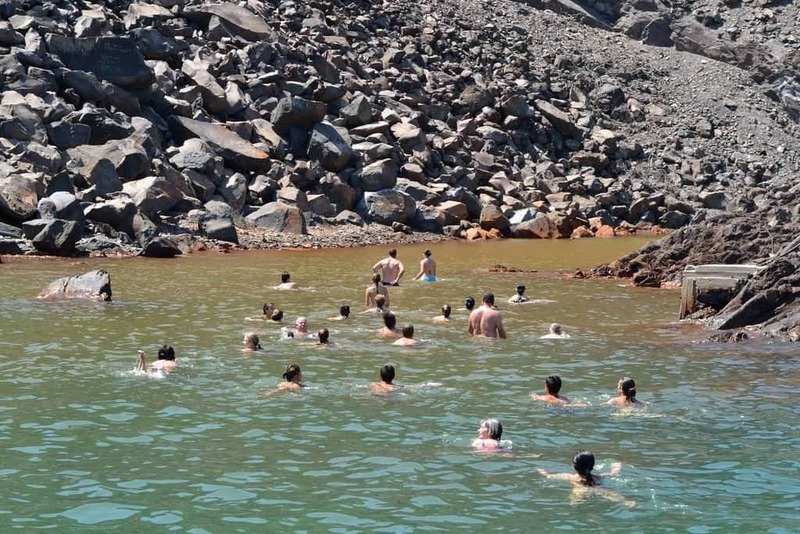 Main characteristics are the red and black mountain top (result of the volcano), the dark blue crystal clear water, underwater hot springs, the red sand and alternating with black pebbles. All these features are that make up a unique landscape. The Red Beach is one of the most famous so rarely get the uncrowded. Although gripped the south wind is not big waves because it’s bay. On the beach you will find a few deckchairs and parasols, while space is available for your own equipment is not very large. The red vertical volcanic rocks and thin, reddish pebbles create a unique image and conflict with umbrellas and colorful silhouettes of people who reach here to admire the rugged landscape and swim. The beach of Perivolos is where it stops Perissa Beach and has some of the most popular beach bar on the island. This is an attraction for young people of all ages as the music plays loudly across the beach, the party is holding daily from morning until late evening. For those who would like to stay here are a few rooms for accommodation, cafes for refreshments and small taverns. Beach gripped the south and east wind. Due to the lack of natural barriers winds here can sometimes be intense. Moonscape, volcanic rocks, exotic atmosphere. South of Perivolos with access from turning after Megalochori or coming from St. George at the end of Perivolos, the beach of Vlychada is another beach where to swim in Santorini. It is an unspoiled beach destination – although in recent years some sunbeds and umbrellas at the beginning of the beach have been added – for those who prefer something more secluded. The beach has fine black sand and dark pebbles, is organized in the beginning. Above the port of Vlychada, between boats and small yachts, will find taverns for food. Sun beds and umbrellas can be found on top of the beach and if you continue walking you can swim with more privacy and relative isolation. 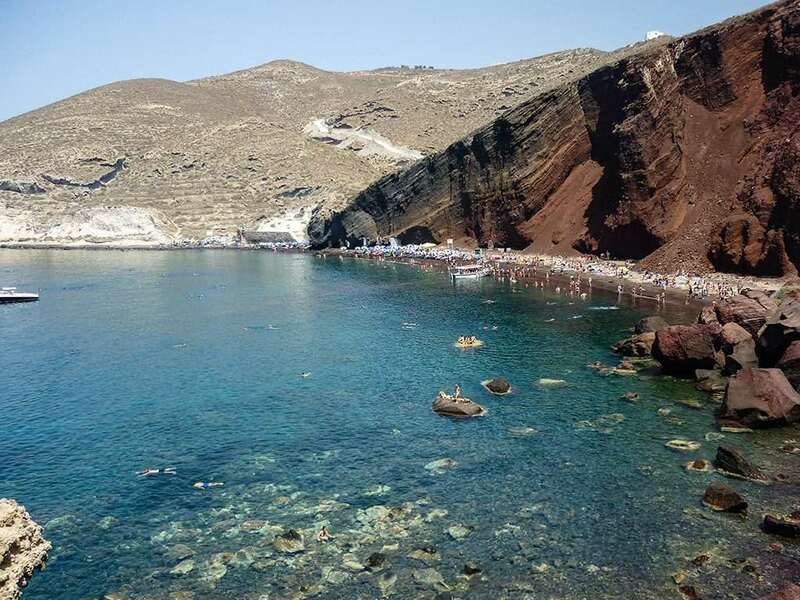 Another spectacular beach where to swim in Santorini, reminiscent of lunar landscapes are the White Beach, which can be reached by boat, to swim and to admire their carven from the saltiness and wind white rocks that encloses. White Beach is a small beach along with black sand and pebbles surrounded by characteristic high and white rocks, from where it got its name. It has a few umbrellas and sunbeds, but do not forget to bring along drinking water, as there is no canteen or restaurant anywhere near. The White Beach, right next to the Red Beach is one of the most popular of the island. You reach it by following the road to the Cape and will surely be impressed by the rare beauty. 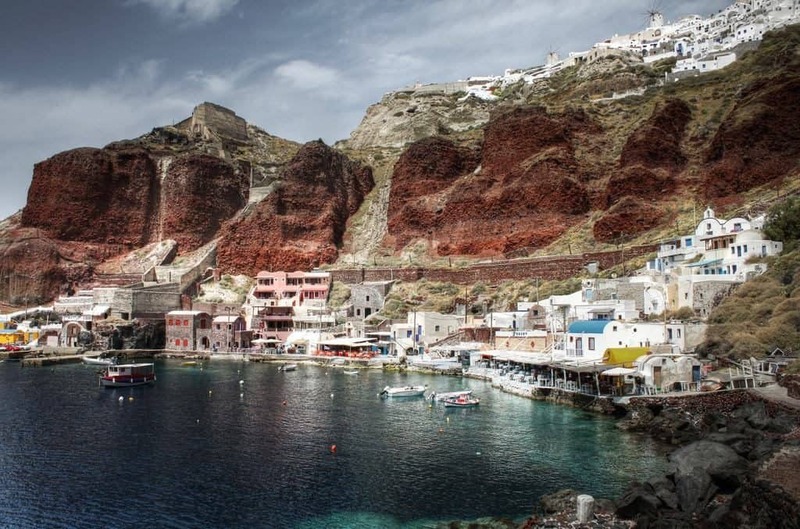 The graphical Ammoudi, the port of Oia, is a tiny creek with wonderful views of the high perched village with its many taverns. 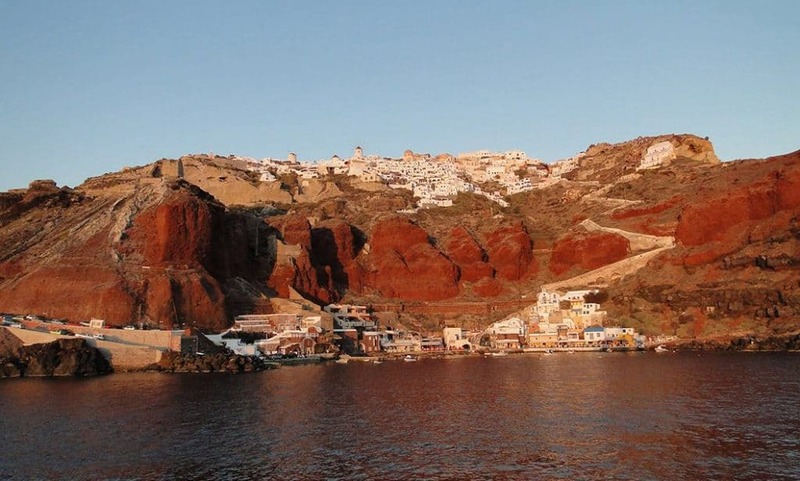 You can reach Amoudi than 214 steps starting from the castle of Oia or the coastal road that connects with the rest of the island. The Oia Castle is one of the best spots and definitely most famous for its magical sunset pictures offer, so particularly in the summer months hundreds of tourists come here to enjoy this unique spectacle of the sunset. However if you want to swim, it is best to follow the trial leading to the rocks and small lighthouse. The trail but does not seem to lead anywhere after a few minutes walking you will find the perfect place to swim even for diving. Very long beach where to swim in Santorini. Logically, you will find available one of the many sun beds for lounging. With thin black pebbles, a few rocks scattered in the sea and a picturesque pier on your left hand, surely the preferences if you want to be comfortable. 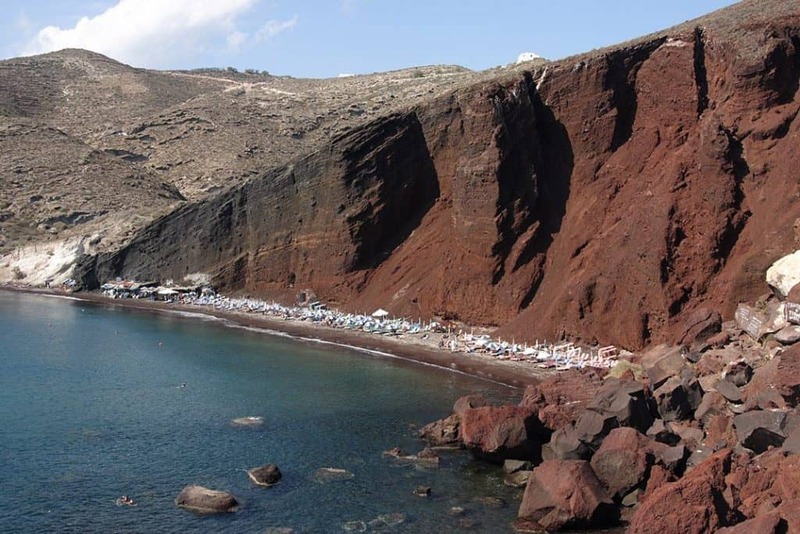 It is one of the two beaches of Santorini with blue flag, the other is Kamari. Located just under 15 km. From Fira. Will come through Emporio, but it will not turn to Agios Georgios or Perivolos. You can also come by bus. The Armeni is a small beach near Oia, overlooking the South Thirassia and clear blue deep waters. It is accessible by boat. The beach is ideal for swimmers seeking special sites for swimming. 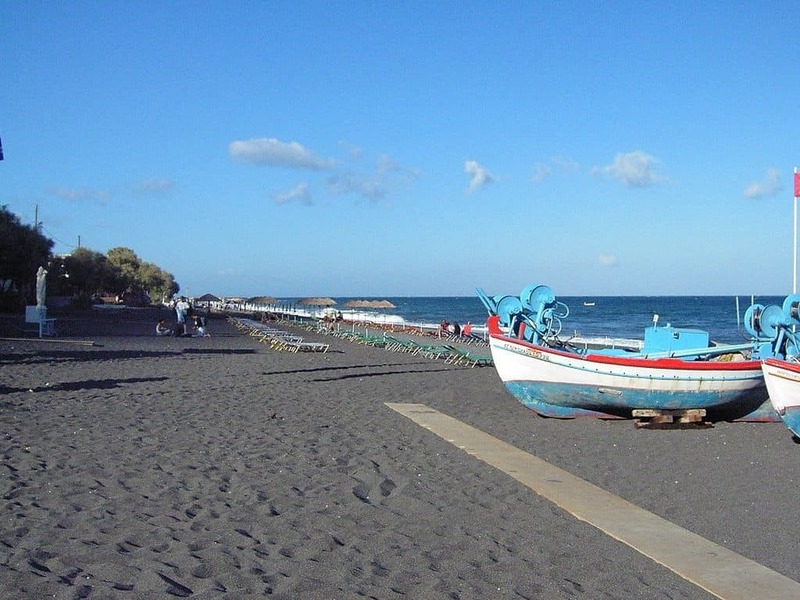 The area offers a diving center, as well as small traditional taverns with local delicacies. 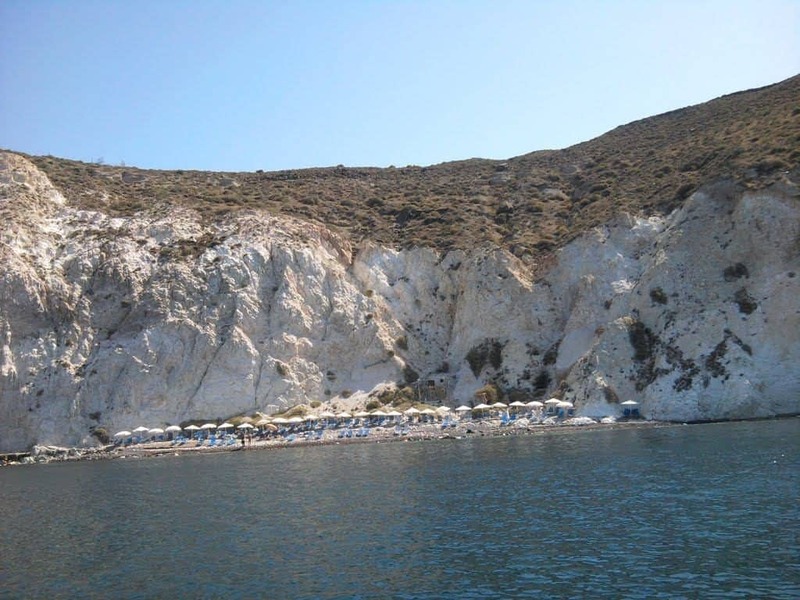 Kamari is a popular beach down hill of ancient Thira, is fully equipped and attracts tourists of all kinds. Along the beach there are numerous cafes and beach bar, restaurants and taverns, clubs and shops and mini-market, bakeries, ATM, tourist offices and a medical center. Kamari is one of the most cosmopolitan organized beaches with wonderful crystal clear waters, countless restaurants and cafes. The beautiful black sandy beach with small pebbles prevails. 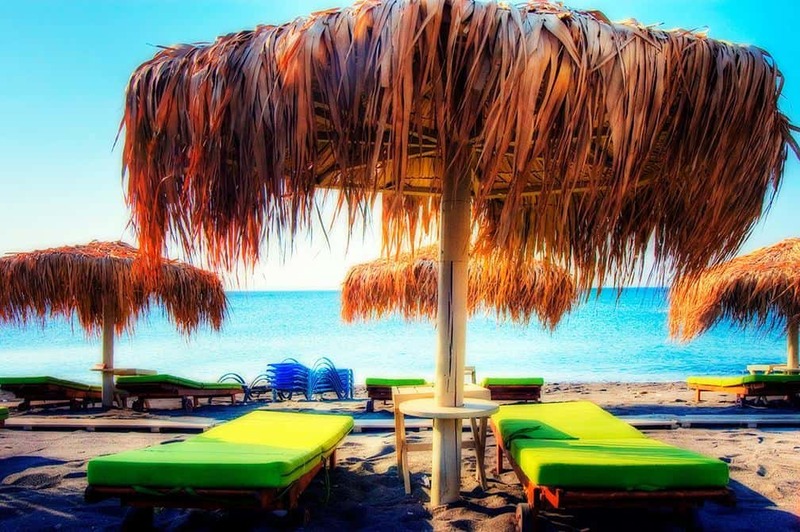 Monolithos has shallow waters, black sand, umbrellas and sunbeds. It is the most famous family beach of Santorini. There is a lifeguard tower and wooden toys for children close to the sea. Also, basketball, beach volley etc. Taverns, some hotels, cafes and mini markets. 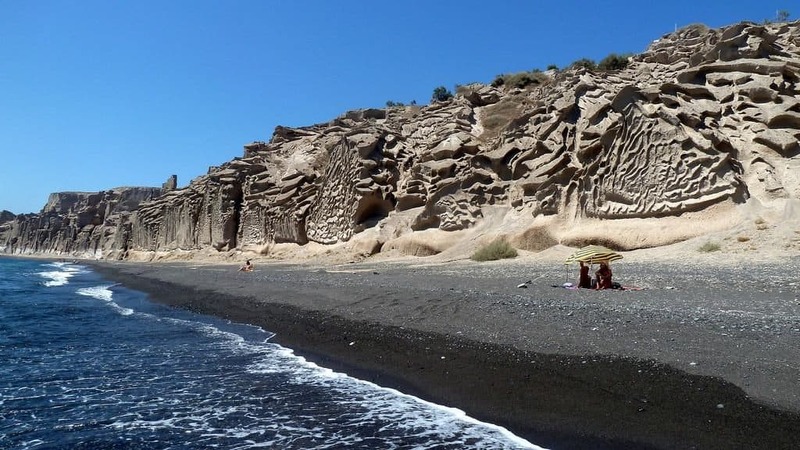 On the beaches of Monolithos you will find the famous black sand beach of Santorini. But they’re really fine sand not pebbles as in most of the other beaches, which even in winter fills the whole area and the road. The village was named after the lonely rock and the continuous increase of smoke smokestack of tomato paste factory. 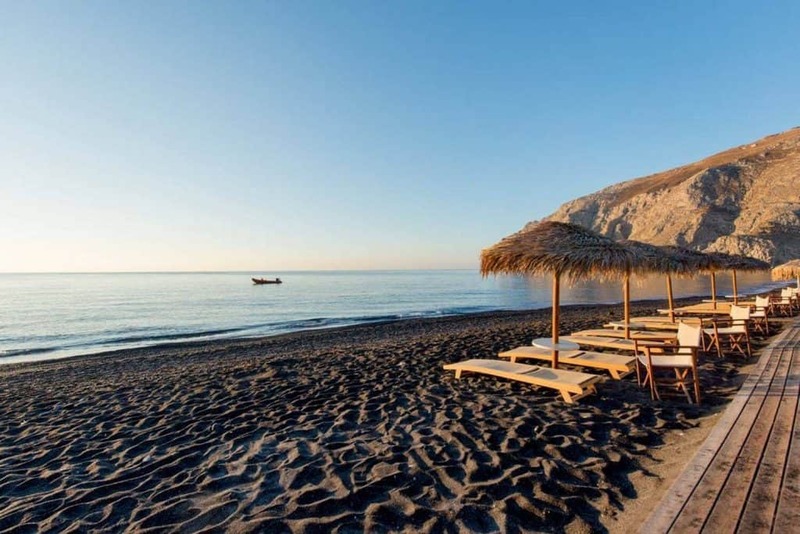 With its wide beach of fine black sand, Monolithos has inevitably developed into a family resort. Daily tours from Mesa Gialos the old port of Fira to the volcanic islands Palea and Nea Kameni. In this tour you should wear lightweight clothes, sports shoes and bring along a bottle of water. The feeling as the boat starts for the craters of the volcano is unique. Palia Kameni’s hot sulfur springs where guests can swim at this point for 10-15 minutes. You need to swim for about 100 meters until you reach the warm waters. We advise you dare, as you near the water color becomes red and warm. Swimming in these waters are said to have medicinal properties but it surely will impress your sense of very hot water and the smell. 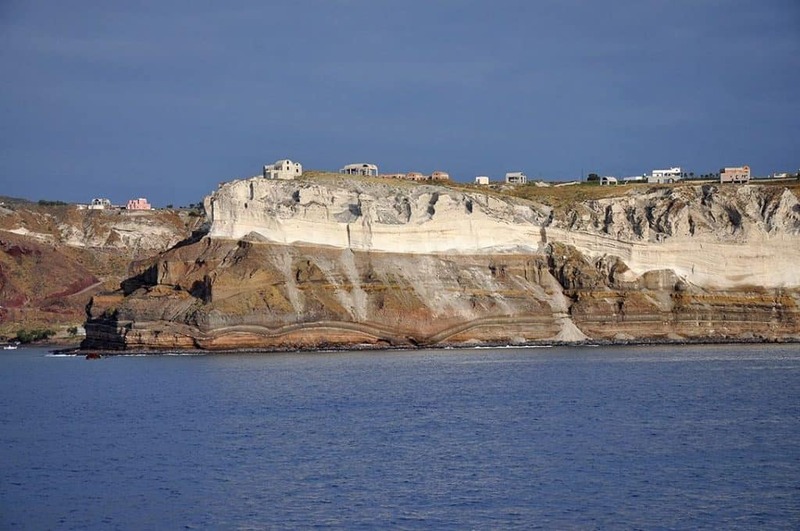 The entire island is a result of volcanic eruption, the rocks are black and the scenery magnificent and wild, while the waters here are yellow-green in sulfur and very warm from the hot springs of the area. 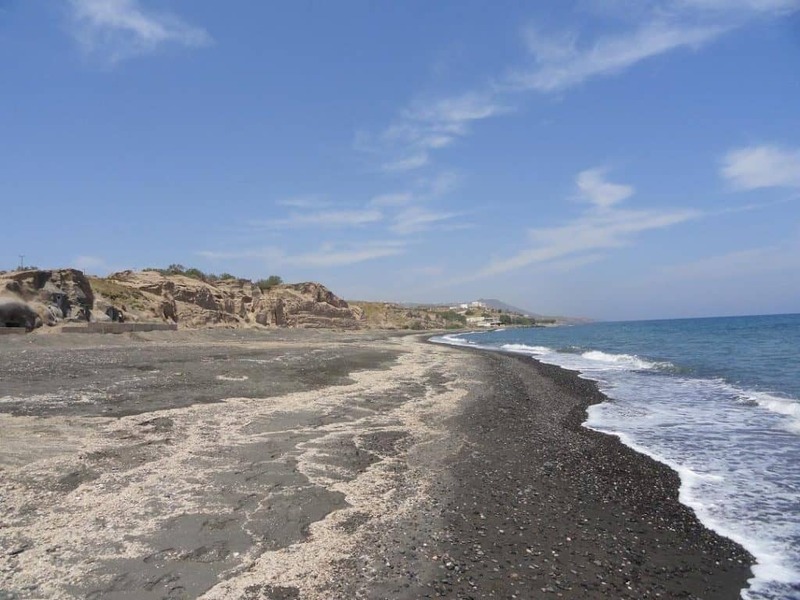 The beach in Akrotiri is another secluded island location, ideal for isolation. Located in the southwest of the island, after the settlement of Akrotiri, between the Lighthouse and the Black Mountain. The beach in Akrotiri is not one of the most famous Santorini since everyone go to the nearby Red Beach. But it is very picturesque and offers and extra bonus there are some fabulous tavernas in the area so you can enjoy your meal overlooking the beach. Visit the famous beaches of Santorini with a rental car from Santorini Holiday Cars.